Below are common attributes associated to Eulalia. Become a care taker for Eulalia! Below are member comments regarding how to plant Eulalia. No comments have been posted regarding how to plant Eulalia. Be the first! Do you know how to plant Eulalia? Below are member comments regarding how to prune Eulalia. No comments have been posted regarding how to prune Eulalia. Be the first! Do you know how to prune Eulalia? Below are member comments regarding how to fertilize Eulalia. No comments have been posted regarding how to fertilize Eulalia. Be the first! Do you know how to fertlize and water Eulalia? Below are member comments regarding how to deal with Eulalia's pests and problems. No comments have been posted regarding how to deal with Eulalia's pests and problems. Be the first! Do you know how to deal with pests and problems with Eulalia? Get Adagio Dwarf Maiden Grass fresh and large directly from the grower to your garden! Buy Adagio Dwarf Maiden Grass online from the nursery wholesalers and save BIG! 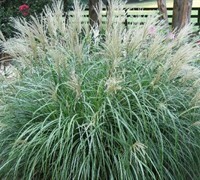 As with many other ornamental grasses, Adagio Dwarf Maiden Grass prefers well-drained soils and full sun. It is useful as a vertical accent and grassy texture in landscape beds and foundation plantings. It looks particularly nice around garden ponds and boulders. Adagio Dwarf Maiden Grass requires no pruning throughout the season. In late winter, before new growth begins to emerge, cut all the dead leaf blades almost to the ground. Adagio Dwarf Maiden Grass requires little if any fertilizer. You can lightly feed it after new growth has emerged in spring with a natural or slow-release shrub & tree type fertilizer. I've seen no insect, pest or disease problems with Adagio Dwarf Maiden Grass. Consistently wet soils can cause problems with the roots.